Chocolate anyone? See's Candies is in town! Today was bike rodeo day at Abby's school. 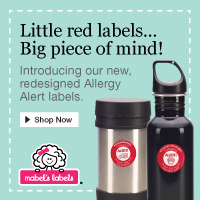 A little something fun for them to do. 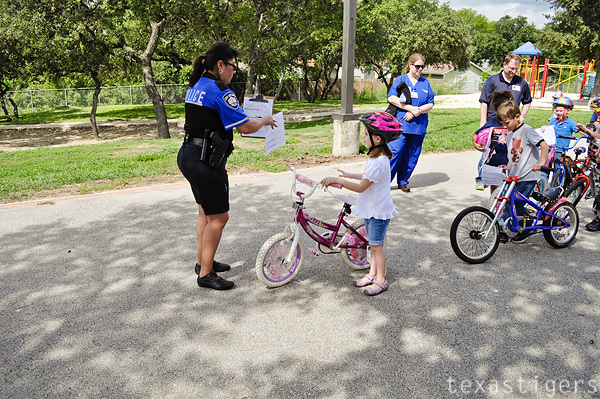 First stop at bike rodeo is a bike inspection. They have a police officer come out and check their reflectors, chain guards, helmet, brakes for a total of 100 possible points. Waiting her turn. 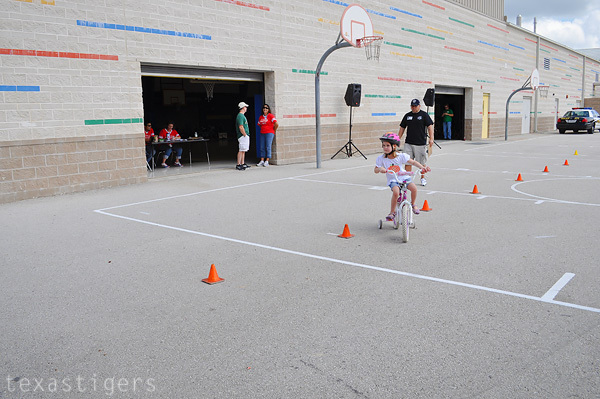 The first event is riding slowly down between two yellow lines without putting your feet down. I feel bad we weren't able to get her confident in riding without training wheels because she wanted to ride well enough for a trophy. However my time to help her riding without training wheels was limited to however long Alexis would sit patiently in the stroller and Abby wasn't distracted by wanting to play with Micah. 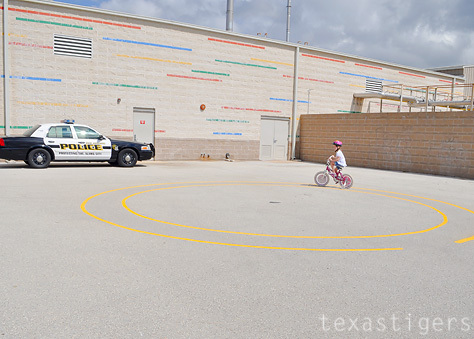 They had to ride in a circle between the lines. Then a straight narrower line to stay in between. And finally weaving between cones. Beau, Micah, Alexis and I headed home while Abby cheered on the rest of her classmates. Micah was a little sad he didn't get to bring his bike when we were heading over but he cheered up and was happy to watch while we were there. We were only there for maybe 20 minutes but man it was hot out today! Our crazy October weather had us in long sleeves and jackets last week and sweating, practically spray park weather this week. As much as I'm ready for the cool, boot wearing weather, I'm hoping it stays warm for halloween. After we left, they had teacher races. Abby was so excited to tell me about how the teachers, principal and vice-principal all rode small bikes and raced. Almost wished I would have stayed and watched! 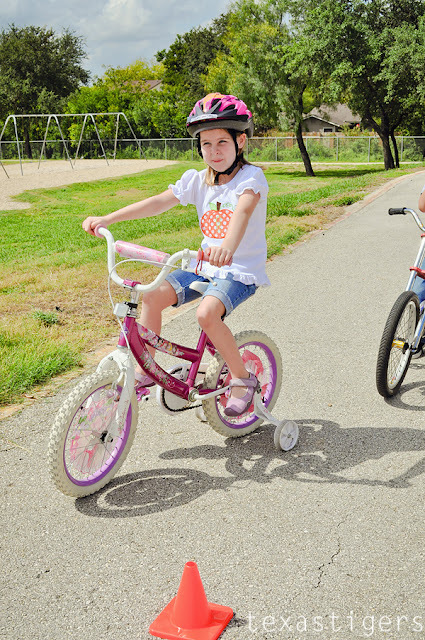 First grade was the last class to have their bike rodeo rotation so it would have been right after their class was finished. 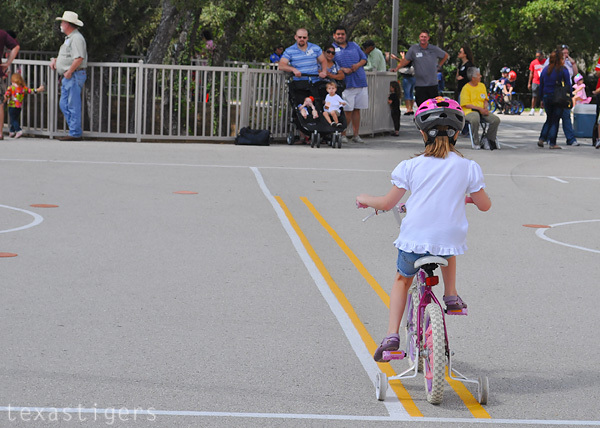 Do ya'll have a bike rodeo at your school? Any other fun activity days that your kids enjoy?